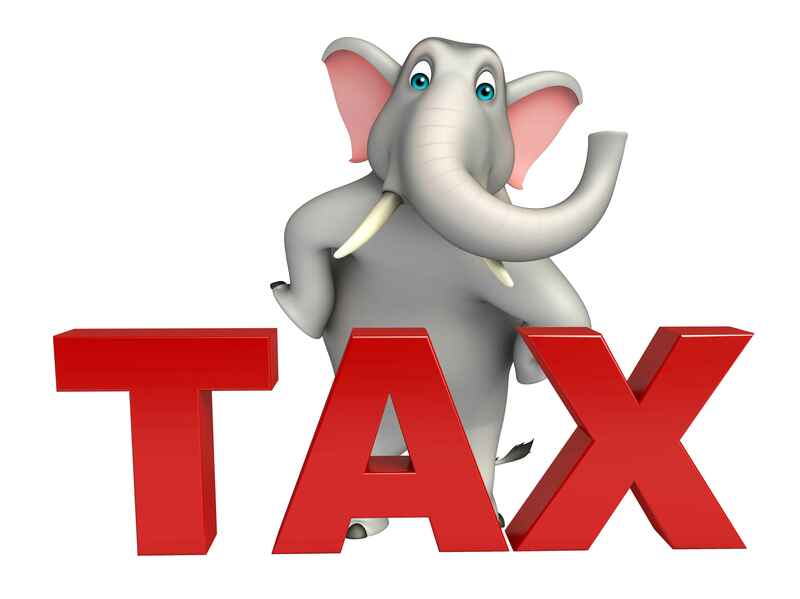 Gold Leaf Advisory | Taxes: the “elephant in the room” that must be dealt with! To understand taxes at a more robust level, I found that I had to take a step back and look at the big picture. In other words, remove any ideas I had and take a look at taxes through the eyes of the government. The politicians themselves must get elected to hold an office. To do this takes money, huge money. Huge money equals huge donors needed and so the story goes. Why do you think that the tax laws are so slanted to the rich? They are the ones who fund the politician’s election campaigns, so these super wealthy corporations and families get to control, to a large extent, what gets taxed and what does not. Once I removed my own personal distaste for taxes of any form, I was able to see the forest from the trees. I saw something that was never brought to my attention or ever discussed in the years of training and books that I had read. What was it, you ask? Was it a new, crazy concept? I wish it was, however it was something so obvious that it was being missed by almost everyone, including me. Moral to the story. Income is taxed to death in America, Assets are not! My feeling is that the government would rather tax the majority of people who show income and leave the owners of actual wealth assets, their biggest contributors, alone. To use this to your advantage, you must move from high income to high asset. Soon we will discuss exactly how this is done, but for now just know that this one move can save you a mountain of cash going forward. Another big issue with tax on income is it prevents most people from ever getting to the next rung. It’s very hard, on your own, to get over the hump and move to the wealth class while 50% of your income is sacrificed each year. “But my CPA is awesome and I think he’s doing a great job for me.” I hear this all the time from prospective clients. That is good, he’s probably doing all he can, but he or she can only work with what you hand them. How you own assets, how you fund retirements, and how you draw income are just some of the details that paint your tax bill before your CPA even comes into the picture. Regardless of who the CPA is for Jim and Suzy in the above example, Jim is showing a $2 million taxable income that must be filed as such, where Suzy does not. So, even if the CPA in this case was the best in the world, Jim’s tax bill will be huge and Suzy will not have one. I am not knocking the CPA in any way, just showing that he or she can only work with what you have done before meeting them. To pay lower taxes then, you must own assets, use leverage, and show the lowest possible income because “income” is the most expensive tax wise. Best possible scenario would be to show no income, but for most this is not possible. For high income professionals, they can be a real headache and create a huge tax time bomb for later. Deferred accounts are for people with little assets and low income in retirement. If your assets and income are more than likely going to be large in retirement, then deferred plans should be used sparingly. Why, because what good is it to build a deferred account to then leave up to the government what tax rate they would like to charge. Do you want to leave your future up to future politicians? We just passed the threshold of the takers outnumbering those funding the government. Prospects for higher taxes in the future are looming large. In later blogs, I will walk you through specific programs that will reduce current income taxes but will not create a future tax risk. These are much more appropriate for high income and high net worth clients. The trick is to create lower tax costs, not to create unknown and potentially higher tax costs going forward. Back to the topic of Leverage. Using proper leverage even includes huge tax benefits. To understand better, think of our young couple wanting to use bank funds to purchase their first home. Once mortgage is in place and funds are disbursed to sellers, what are the tax implications to our couple? Do they receive a tax bill for the money they borrowed? No, they do not pay a cent in tax on the $200,000 the bank paid for their home. Even better, they get to deduct the interest from their income so they pay less in tax each year. If they had to save up to buy the house, they would have to earn $300,000 to $400,000, depending on tax rate just to write a check for $200,000. I know this is a small example, but the logic and math works regardless of the amounts used. One thing I get asked is should I pay off my mortgage? The right answer is no, the only time it makes sense is if the person just has to do it to feel better about things. But mathematically, it does not ever make sense. Why it does not make sense to pay off mortgage, even if it would cause no financial harm? The last point is crucial as a lot of people were in trouble during the last housing crash. I heard of a lady that owned 10 homes free and clear. Her husband became deathly ill and after a year died. The lady got cancer and needed money for treatments not covered by insurance. Guess what, she could not get a mortgage even though she owned 10 homes. Why, she didn’t show enough income and did not have a job. If they would have kept mortgages on homes, they would have had the money available for such a dark time and would have had more money to grow their Real Estate portfolio. OPM is great and must be a part of the game of anyone who wants to win this money game. Taxes are an issue for those who bury their head in the sand, go out and make big money, and hope they can out earn the tax man. The more you earn, the smarter your tax strategy must be or you will end up super frustrated. I spent the first 20 years in business not paying a lot of attention to taxes until it finally reached a point where I had to learn to use the knowledge I’m sharing with you. I hate to think about the millions I paid because I remained ignorant on how to lower and eliminate taxes like the super rich. Not to mention, all the interest that could have been earned on the money. Once tax dollars leave your checking account, they and their growth potential are gone forever. We will go into this more thoroughly as we progress, but the summary for taxes is that income is bad because it is taxed at the highest rate, assets are good and taxed much less, and leverage is beautiful because it is not taxed and can even create a deductible expense when structured correctly. Many people were upset that Donald Trump stated during the debates that he has not paid income taxes for years because of previous losses. He simply used the laws to his advantage. The problem most of us have that came from middle class roots, is that we think about taxes like middle class people even when we start earning NON middle class money. Taxes are not a big deal for middle class because after deductions many even get a refund. Escalate that income and bam, your tax bill goes up like a rocket. In California, the state can even tax you up to 13.3% on top of the Federal taxes. If all taxes are considered, you could be paying nearly 60% of your income to tax authorities. By holding these types of assets, you move away from getting taxed to death to winning the game. Take Real Estate. You can own with little money and leverage, and it can grow and grow without being taxed. So, you can start “trading pennies for dollars instead of dollars for pennies”. The crushing taxation system is not a factor and the biggest risk taker is the bank, not you. How much more can be created in that environment versus just going out and earning a ton to give away half to a thankless government entity? Many of your colleagues, maybe even you, have funneled most of their savings to the tax deferred bucket. As we discussed, this will not be good going forward. The account grows and then you take it out. You will pay taxes, whatever rate the government decides at the time of withdrawal, on your money and all of the growth as well. I don’t know how many people I have met over the years who are so proud of a large Qualified Account balance till I run the numbers and show them how much is due in taxes. Not to get off from taxes but Qualified accounts for wealthy people also carry stiff penalties for any access prior to 59.5 years old. This restricted access curbs your capacity by not allowing you to take advantage of opportunities and even take care of problems as they arise. Why do CPAs and many advisors push people toward Qualified Accounts? Two reasons. First, people want their tax professional to reduce their current tax bill and they don’t have other ideas about how to create the same effect without using a Qualified Account, so ignorant of better alternatives. And reason two, they are not thinking smart about the high level client by taking all of assets into account. What I mean is when you add up all the assets, you can figure with good accuracy how much that estate and income will be produced in the future. If the tax person is just doing taxes and not working with financial consultant who knows all of the assets, they are not accounting for future income sources that would make the Qualified Account income get taxed to death. Many times these days, high net worth families actually retire into a higher tax rate than when they are working. With better planning, this need not be the case. Why are they at a higher tax rate in retirement? A little extra, more holistic planning would have enabled them to retire into low tax rate. But you must work with a team that understands how to reduce current tax as well as reduce or even eliminate future tax liability. Tax reduction must be a priority for anyone who wants to move to the wealthy side of society. It is the reason that corporations and the super-rich hire teams of tax specialists to offset the tax authorities at every turn. When we discuss actual case examples, you will see first hand how dramatic tax control can enhance or destroy your wealth position. For now, just know that by doing as the rich do with regard to taxes, you will immediately start seeing positive results. Many people are so uninformed about money, they actually believe the lie that you have to take huge risks to become wealthy. Taxes are another piece of the pie that the only risk you take is ignoring or not making their reduction a priority from here on out. If you don’t know how, make sure you get with someone or a team that does. It will make huge difference without any risk to your money. It will also make life much easier when tax payments are due. You have no obligation except to pay the absolute minimum amount due to satisfy the government. They will continue to want more and more; chase down and tax the uninformed to poverty; just do not let that be you. On a positive, every tax rule has an antidote. They slip those nuggets in for their supporters, if you know what I mean. Many times, a few changes and your entire tax bill is transformed to a manageable expense instead of the dreaded monster it can be. Instead of leaving the front door open for all to enter, using IRS tax code compliant strategies can be the gifts that keeps on giving. Why did I and most others play victim to the IRS for so long? Because they are good at taking our money and I did not know the rules of the game, let alone how to play to win. They tend to pick heavily on the newly minted, those who came from the average class and attempt to play in the big leagues. They got a lot of my money in the process but no more. Now I pay them what I owe, but not a cent more. What I owe is a whole lot less on a whole lot more. I am grateful for them though, because getting sick of every increasing tax bills is what really was the start of my search to find the keys to true wealth. With the Federal government about to pass over the $20 Trillion debt level and probably over a $100 Trillion of unfunded future liabilities like Social Security and Medicare; not to mention broke cities and states; now is probably the best time ever to find out about how to become uber efficient with regard to taxes. On a personal note, if I would not have corrected my tax planning, I would probably have just stopped earning income because I was so frustrated and confused at how much they took. I was being stubborn instead of smart. The best part of the experience is that I can relate to clients who have yet to get smart about taxes and really help them over to the other side where it’s not nearly as taxing. I believe that as business people, it’s so easy to get so caught up in business that taxes and tax planning become an afterthought. It doesn’t make sense to go make a ton of money and then owe the highest possible amount, but I feel that the government knows we are too distracted to pay proper attention to their tax rules. I am not suggesting, in any way, not to pay your tax bill. What I am saying is simply to use the tax code to your advantage. Own the right assets, reduce income by using any of a number of great methods, use leverage, and stay clear of deferred accounts that are tax time bombs when your path is high achievement. To learn more about our programs, click here .